It was way back in 1968, during the month of April, when Shrii P. R. Sarkar visited the historic city of Hyderabad . It was the second visit by him to the twin cities, Hyderabad and Secunderabad. While the details of his first visit are not so well known, the second visit was truly historic for many reasons. A large gathering of meditation practitioners, particularly many youth, mainly students from the university from the faculties of Engineering and Medicine and Post Graduate Science students, were among those who came to meet him and listen to his discourses. It was on this special occasion that he expressed his desire that a primary school based on the Ananda Marga system of education should be started in this city. A monk was appointed for this purpose. Shrii P. R. Sarkar himself gave the duty to the local district secretary of Ananda Marga, Shri Ramachandra Reddy to procure the land and construct the building of the school. Ramachandra Reddy was a retired superintendent engineer in civil engineering and a well-known person in Hyderabad for his high standard of morality, integrity and devotion. 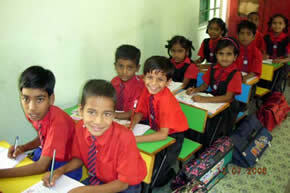 Soon a building was rented in the Saidabad colony, a primarily government employees residential colony and from the month of June 1968, the school was started. The school became an instant success and in just over two months time, the number of students crossed 70 and the school building became too small to accommodate more students. Though there were several reputed schools around, this Ananda Marga School became popular for the high standard of its educational programme and its moral and spiritual teachings. The Chief Minister of the State of Andhra Pradesh became well aware of the popularity of the school and being close to Shri Ramachandra Reddy allotted a plot of 2500 square yards free of cost to Ananda Marga for the school’s permanent facilities. The Chief Minister well selected and sanctioned from three pieces of plots the one which was closer to the school already running and that had a huge park with lots of greenery behind it and a children’s park in front it. Shri Reddy, being a construction engineer planned and constructed the school building in record time and he did it by spending money from his personal savings and not seeking any donation. He signed as ‘Anandamurti’ in Roman script. (As spiritual preceptor of Ananda Marga, he is referred to as Shrii Shrii Anandamurtiji). The school went on increasing it’s strength and was always popular. 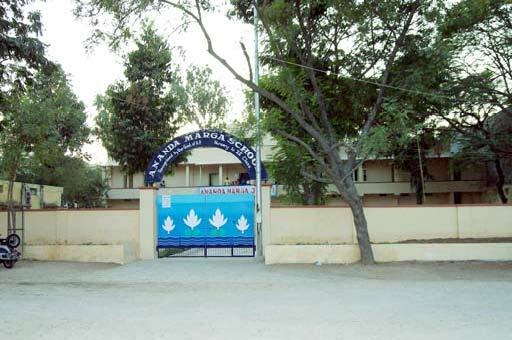 During the time of Indira Gandhi’s Emergency, the school was captured by some elements that were hostile to Ananda Marga. But just after the emergency was lifted the school was handed over to us by court orders. His visits we feel were a rare and unique blessing to our school. So far no school had such a kind privilege of having the founder of Ananda Marga schools, sign the visitor’s book twice. Now due to the continuous efforts of the principal, the school staff, the local district secretary and local members, the school has a high standard of building infrastructure, education and moral and spiritual teachings. Recently also the State Government has taken note of the standard of the school and the school has been recognized and accredited. 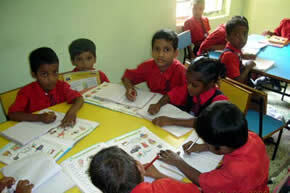 At present the number of children is 128. There are 6 teachers including a well qualified teacher in-charge striving to make this institute a model NHE centre. The principal of the school, Ac. Abhaya Shankarananda Avt., is overseeing the curriculum, the play way methods, the arts, and yoga and meditation practice as a regular routine in the big meditation hall. Periodically there are competitions of games and sports. Classrooms are well furnished with good quality modern furniture. 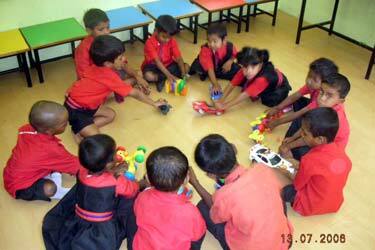 The school office is well furnished similarly to other regular good standard public schools. Recently the teaching staff along with the students became serious about developing a beautiful garden with colourful flowers. Students really enjoy giving love and care to all these plants and flowers. This year our school gained a very good impression from the surrounding public due to renovation of the old building in an attractive paint after a long period. The new look of the building is really attracting the attention of the parents as well as the public. s the school advisory committee chairman, I am honored to have the opportunity to supervise everything personally and all the members of the different committees are working unitedly in making the school worthy of its purpose . We all are very much hopeful to fulfil the desire of our founder Shrii P. R. Sakar by establishing a model NHE Centre as well as Research Centre here in Hyderabad .